Humble is located in Harris County and is roughly 18 miles from the Houston city limit. There are many things to do in the beautiful city of Humble and it’s no surprise to see many people out shopping and dining with friends and family. The weather is usually just right. No wonder most people here have forgotten to take the time out and examine their carpets in the home or business. Have you noticed an increase in the number of stains or does your carpet appear to be a darker shade than you remember it being originally? 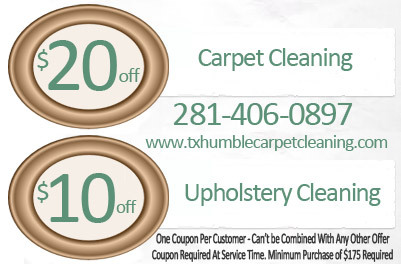 Humble Carpet Cleaners can help! Carpets can attract dirt and dust which can not only affect the overall appearance of your carpet but can also trigger respiratory illnesses and allergies. It is recommended that you have your carpets cleaned at least once annually. Our cleaning technicians have many years of hands on experience with various rug, carpet, and other fibers. We know that not every carpet is the same so we take the time out to do an evaluation to determine which cleaning method is appropriate. We utilize powerful truck mounted steam cleaning to effectively go beneath the surface of your carpets fibers to loosen and lift dirt from where it is hiding. For problem areas, we use a specially formulated pretreatment solution to ensure that those pesky stains is removed with no problems.